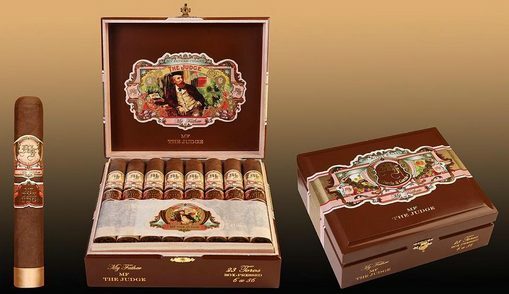 This new offering from My Father Cigars immediately brings back thoughts of the early cigars made by Don José “Pepin” Garcia: opening with a blast of pepper; winding gradually down a bit to a creamy, rich taste; and building in strength along the way. Box-pressed and nearly covered with bands, The Judge, a regular production line, combines the My Father Nicaraguan filler blend with an Ecuadorian Sumatra Oscuro wrapper. At about $12, it’s a bargain.